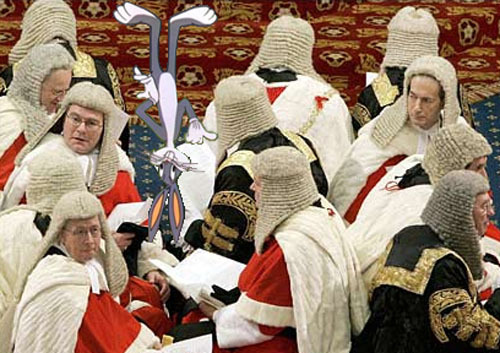 The Supreme Court of the United Kingdom — formerly known as the Law Lords of the House of Lords, the highest appeals court in the British legal hierarchy — ruled yesterday that Oleg Deripaska should be denied permission to appeal against the earlier rulings of four judges, who have ordered him to face trial on charges he defrauded Michael Cherney (Mikhail Chernoy), his former business partner, and founder of the Russian aluminium monopoly, of his rightful stake in the company, Rusal. In proceedings before High Court Justice Christopher Clarke in 2008, and before the Court of Appeal this year, Cherney is claiming a 13% shareholding, worth at least $4 billion. 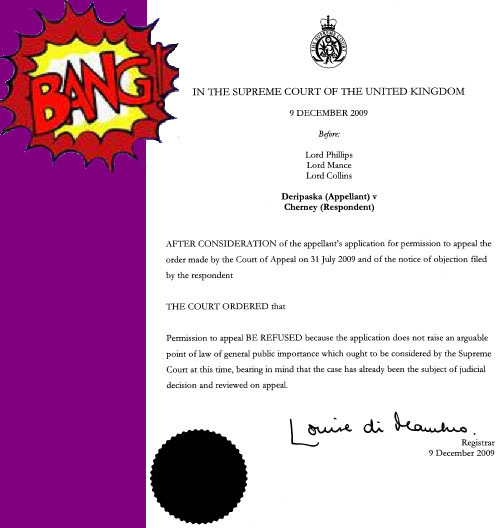 Clarke ruled that Cherney’s claim should be heard in the UK High Court, and that when it is, the claim has “a reasonable prospect of success”. Deripaska has now failed before three appellate judges and three Supreme Court justices to avoid a trial on this claim. The timing of the London order comes days after the Hong Kong Exchange refused to approve Deripaska’s application to sell Rusal shares on that exchange. But even as the London court ruling was issued on Monday, Rusal sources were telling the press in Moscow that they still hope to find sharebuyers in the Hong Kong market, and to gain the approval of the local bourse to start selling the shares next month. There is a long list of international banks, which in order to do business with Deripaska’s aluminium company for the boom years of aluminium trading, have accepted claims about the shareholding of Rusal which, to date, the UK courts have now not accepted; have suspected of being doubtful; or require the test and rules of evidence in an unrigged international court to verify. All these banks, including those listed as underwriters for the Hong Kong share sale — Credit Suisse, BNP Paribas — are now placing themselves in the position of making unsubstantiated warranties in Rusal’s Hong Kong share prospectus that are the subject of an international trial — for Deripaska, this trial will be his very first. Lawyers in London believe that Justice Clarke, who is supervising the trial of Cherney’s claims and Deripaska’s defence, has demonstrated impatience with delaying tactics since the case began in 2006. He is likely, the sources believe, to schedule the trial to start by April next.